The No. 8 Salisbury University Men’s Lacrosse team earned its 19th Capital Athletic Conference championship on Saturday with a 14-5 victory over Frostburg Sate University at Sea Gull Stadium. Salisbury started the game with a 4-0 run 33 seconds into the game, when James Burton found Cason Kalama in the crease for a quick 1-0 lead. Thomas Ciriillo added the second goal for the Sea Gulls when he launched a low shot that flew past the Frostburg goalie for a 2-0 lead. The score would remain there for the remainder of the first quarter. Goalkeeper Connor Anderson had one of the best days of his lacrosse career keeping Frostburg out of the goal, for the first quarter and a half, recording a career high 16 saves while earning his 13th win of the season. Burton scored his second goal thanks to a pass from Cirillo minutes into the second quarter. Mike Kane then added a goal by scoring from the right side of the crease to give Salisbury a 4-0 lead. Frostburg would then answer with two goals, cutting the score in half to 4-2, before Sean Fitzgerald added another goal for the Sea Gulls to start a 9-0 run for Salisbury. Burton added his second goal to close out the first half with just over one minute left to give Salisbury a 6-2 halftime lead. At the half Frostburg had a slight lead in shots taken 26-24, ground balls 19-14, and had won 7-10 face offs. Salisbury opened up the second half with a man-up opportunity, which would begin a 7-0 run through the third quarter. Nathan Blondino found Kalama just thirty seconds into the third quarter. Cameron Maples then won the following face off and drove straight down the middle unassisted to score for Salisbury just eight seconds later. Davis Anderson then did the same thing off of a Frostburg turnover, driving right down the middle of the field for Salisbury’s third goal in a matter of minutes to give a 9-2 lead. The 10th goal for Salisbury came from Christian Ottenritter from the left side of the crease. Kalama added two more goals, leading the team with four, and also scoring his 50th goal for the season. Fitzgerald added his second to close out the third quarter with a 13-2 lead. Cirillo would add the final goal for Salisbury with just over 8 minutes left in the game. As the CAC champion, Salisbury has earned an automatic bid into the NCAA tournament. Salisbury University’s Homecoming and Family Weekend had a special significance for Salisbury athletics and alumni. On Saturday October 18, Salisbury revealed the designs of its new $19 million stadium, as well as a $10 million renovation for other athletic facilities around campus. “This is the largest athletics construction project during my 25 years here,” said Dr. Michael Vienna, athletics director. “This will put our stadium on par with the better Division III stadiums. Two nearly 80-foot tall towers will anchor the new stadium. It will have bleacher seating for almost 5,000 people, with about 2,800 on the home side. Inside the stadium, the first floor will have four locker rooms for our field hockey, football, and men’s and women’s lacrosse teams, as well as one for visiting teams and referees. “And I can tell you, our athletes and coaches are thrilled at the idea of not having to share spaces and walk under Route 13 from Maggs Gym anymore” said, President Dudley-Eshbach. There will also be a retail shop selling Salisbury gear, a full concession stand, a ticket office, storage and, of course public restrooms. The second floor will feature an athletic training clinic and a classroom for team meetings. The third floor will have five covered suites for dignitaries and special guests. The fourth floor will be the stadium’s “nerve center” on game day. It will have a press box; a production booth for the Sea Gull Sports Network; coaches booths for home and visiting teams; radio booths for local and visiting broadcasters; and a game operations area for sports information staff, scoreboard and clock operators, and announcers. A major renovation of athletics playing field is being brought up for East Campus as well. A new tennis building will be added near the new tennis courts. Improvements for athletic fields include new bleachers and press boxes for baseball, softball, and men and women’s rugby teams. The ultimate goal for the athletics complex is a new field house. Though that is sometime in the future Vienna believes it would be transformative for the campus. These renovations are expected to take a couple of years. 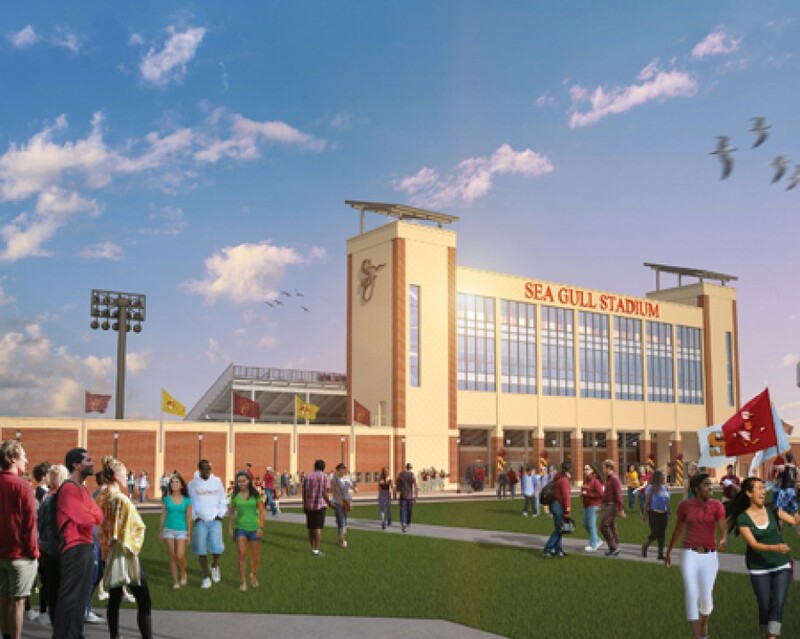 The new Sea Gull Stadium is expected to open in Spring 2016, with construction beginning after Christmas this year. A Look At The Current Records Of Some Salisbury Teams!